Aircraft Hose - Aircraft Refueling Hose - Titan SW344 Aircraft Jac-Riser Hose and Goodyear Wingcraft Hose - Aircraft Refueling Hoses - JGB Enterprises, Inc.
JGB is proud to present our Aircraft Refueling Hose. 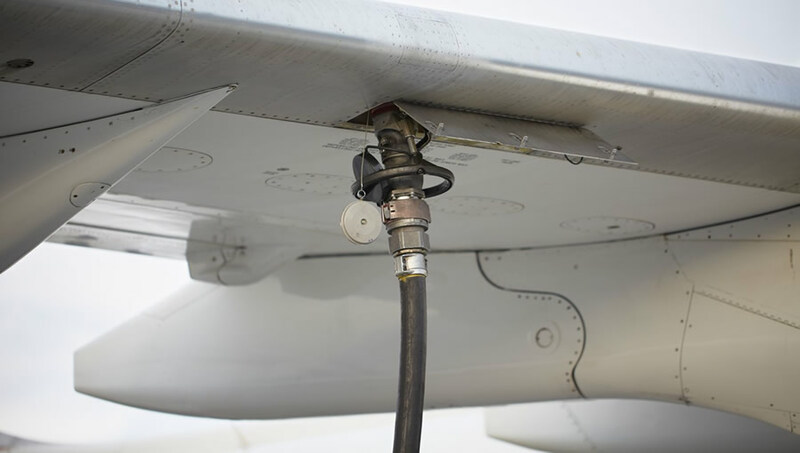 The Aircraft Refueling Hose is for fueling and defueling commercial and private aircraft. It handles jet fuel and the higher aromatic aviation gasolines. Its high working pressure permits use in fuel cart hydrant service. Designed for aircraft refuelers equipped with moveable service platforms. Dual helix construction provides excellent suction and discharge service. Used as a flexible connection between the hydrant cart chassis and adjustable platform. Meets or exceeds all recommendations for BS EN1361:1997/E. Maximum w.p. 300 PSI. Pressure tested to 600 PSI. Note: Sold in coupled, tested, and certified lengths. Multiple plies of polyester yarn with dual wire helix. Black Wingprene® (ORS) static dissipating/static conductive synthetic rubber. Continuous brand example: "Goodyear T Aircraft Fueling Hose Wingcraft NFPA 407, API 1529/1988 Type C, Grade 2." Scovil 520-H male one-time by male one-time.